We’re thirteen days into the New Year now, but I wanted to jump in with this any way. The big trend right now is to find “Your Word” for the year. Something that gives you focus for what lays ahead of you. Resolutions now in bite-size. 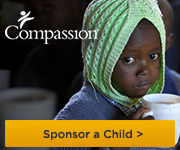 I thought that Compassion Wednesday would be the perfect time to share, and I hope you’ll see why. This encapsulates so much that I am facing and so much that I want to finally wrap my head and heart around. I’m almost 40, so it’s about time I “get it”. Enough means everything to me that the three young ladies sing in the song above. God is more than enough for me, in every way. Jesus is sufficient. Not religion, not my striving to “be a good person”, nor any other criterion I may place on myself or others. He is enough. Enough to save. Enough to transform. Enough to motivate. Enough to sustain. I am, probably like most of us, constantly striving to “better myself”. I want to be a better husband, a better father, a better neighbor, a better human being. All of those are great desires, and things I should always continue to search and strive to become, but they are not my end. They are not my means. They are not my essence. Jesus is. He is the reason I want to be a better husband, father, human being. There are lots of great reasons for any of us to be “better and kinder and more loving”, but none will sustain me as deeply and as surely as Jesus. Some days I don’t want to be so kind. Some days I don’t want to show grace to so-and-so that cut me off in traffic. Some days I want to find justification or retribution for whatever perceived wrong that was done to me. Jesus shows me another way, a better way, a way that I cannot live out without his sufficiency. I know I’ll mess up, I’ll lose my patience, I’ll get angry, I’ll be the complete opposite of “better and kinder and more loving”, but I know he’ll be sufficient to help me overcome those days. He’ll be more than Enough to help me mend those relationships I’ve wrecked. This is still a strong struggle of mine, honestly. I think a lot of us struggle with self-esteem in one form or another. The constant comparison games we play day-in-and-day-out make us believe that we are lacking in some way. Sometimes, in ways that we believe we will never overcome. I will constantly strive to learn, to gain knowledge and wisdom. That’s not what I’m talking about. What I mean is that I don’t have to improve myself in order for feel validated or loved. My wife loves me. My children love me. That sounds like platitudes, maybe a little childish to some, but it’s the truth. And He loved me not because of who I could be. Not because of the changes that will be wrought throughout my life. Not because of anything I will do or say or how many lives I will affect positively or how “good” my life is. He loves me because I am me. Warts and all. Inside and out. Now, you might say that this goes back to my first point, about His sufficiency. It does. But that’s how much that first point affects everything else. I’ve had a long, hard battle in loving or even liking myself. Still not too keen some days. But I am sustained on the simple truth that Jesus loves me. And if the Creator of everything thinks I’m lovable in some way, then there just might be something there for me to love as well. And that means You’re Enough, too. What I don’t mean is that I’m going to be static. This doesn’t mean that I won’t be open to doing more to make this world a better place. It does mean that even though I can’t do everything, and sometimes that rips at me in ways I can’t explain, what I do is enough. I cannot do everything. I cannot help everyone. I want to. I really want to. But I can’t. However, when I don’t give money or aid in one form or another to someone, it doesn’t mean I’m numb to them or their need. Even if I can’t do everything, I can do something. And that’s Enough. Everything little thing that I do, or You do, is enough to change that one small portion of the world. The hurt and pain of this world can be overwhelming. We want to heal everyone and everything, but we find ourselves unable. Sometimes, that can be paralyzing. So, taking the small bites is Enough. I have to remember that. It may seem small and trivial to me at times, but it is Enough. Those small bites build on each other. And I may take a small bite, and You might take a small bite, and someone else may take a small bite. With all of those small bites, it quickly becomes more than enough. So, I’ll stop being overwhelmed and paralyzed. I’ll stop blaming myself for “not doing enough”. I’ll keep doing what I am doing. Now and then I will do more. And this, too, reaches back to my first point. I can’t change the world, but Jesus can. He is sufficient. And, He will one day restore the world to what He has planned. Without pain and suffering and anguish and blame and evil. Until then, by His strength, what I do is enough. For today. And it will be for tomorrow. What I have is more than Enough. My family. My job. My life. My family has never been a question. They are more than I deserve, and to express my thankfulness to them and to God for them seems a task I cannot ever complete. My job is something I am more than thankful for. It’s a great job, but I haven’t always had the greatest attitude toward it. With the desire to be a full time author, I’ve seen it as everything from a stepping stone to an obstacle. From writing to ministry, I’ve felt hindered because of my job. This is an attitude I need to step away from and never look back. My job may not be my dream. I’m not giving up on my dreams. However, my job is where I am in the here and now. It has provided everything I and my family have needed and so much more. And yes, I really do have an incredible job. I’ve learned that if I’m not satisfied now, I won’t be satisfied in anything I do. One day things may change, for good or for bad, but this is where I am and I will make the best of it. Here lies my ministry and here my dreams can flourish with an incubation of security for my family. It does not hinder me. Only I do that, and only I can undo that. My life. Where do I start? I’m always looking for the “next big thing”, the next step, the next adventure. They never come. Not when I’m expending so much energy looking for them. They usually happen in the places I’m not looking anyway. If I pour all of my energy into looking for the next adventure, I miss the one that’s happening around me right now. I mentioned my family above. Believe me, every day is an adventure. Life happens now, not tomorrow, not yesterday. So, my word for the year is Enough. So many facets that I don’t think I’ve scratched the surface for what it will and does mean to me. However, I’ve rambled on too long. And I think this is Enough. This is a beautiful post. I haven’t given my word tons of thought yet, but I think it would be TRUST. More trust in God, more trust in things to work out well through the will of God. Thank you for such a thought provoking post. God bless you and your family in 2016 and always.